Twin Buttes has some new cross-country trails that are definitely worth experiencing if you are on foot, a bike, or a horse. 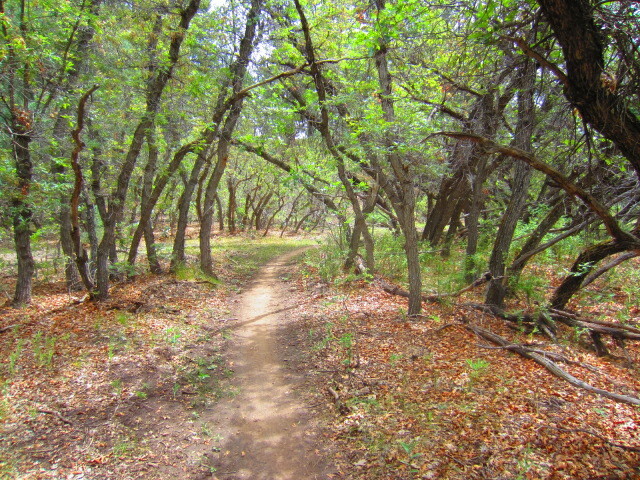 This Ed and Flo Trail runs through some majestic stands of scrub oak. Never thought I’d use the work majestic to describe such a prolific, almost invasive type of brush. 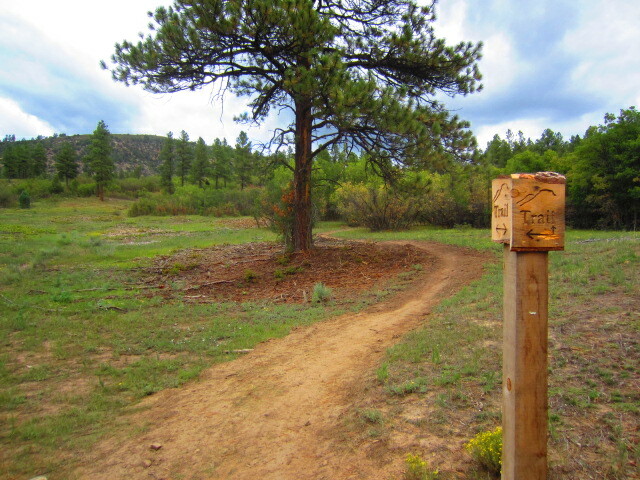 The newest addition to these trails, the Cliffrock Trail, was put in this month by Trails 2000, which connects new single track to and from the old BC&F railroad-grade road to make a decent-sized loop running directly south of Perins Peak. 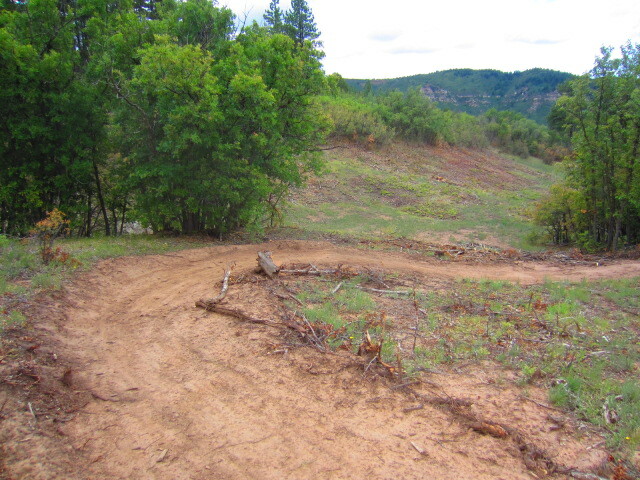 The most recently constructed loop will be very close to a tie-in point with the trails on the western edge of the Test Tracks behind Hogsback. 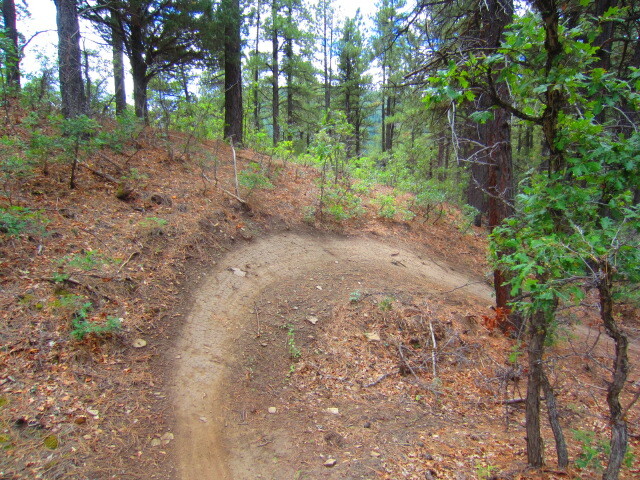 These trails by Twin Buttes can be ridden by beginner to intermediate-level riders with minimal technical features to be wary of. They’re smooth, fast and have banking turns in many areas. The water diversion features are very effective, yet friendly and dynamic to ride or run across. Building trail with a mini-excavator can get the job done faster than it would with hand tools, but leaves a bigger footprint on the land, as seen here. Decide for yourself what to think of this switch-backing Twin Buttes Trail heading up from the Giant gas station towards the base of the Twin Buttes. climb out of the parking lot area at the bottom, the switchbacks leading up to the eastern Butte, and some huge banking turns here and there. 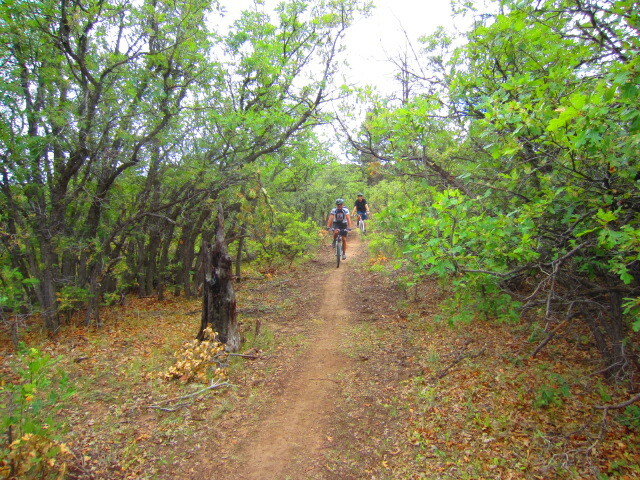 Besides that, they are very easy trails to ride for beginners. I think a general clockwise or counterclockwise direction of traffic could be reasonable here, although most people I saw up there were traveling counterclockwise. 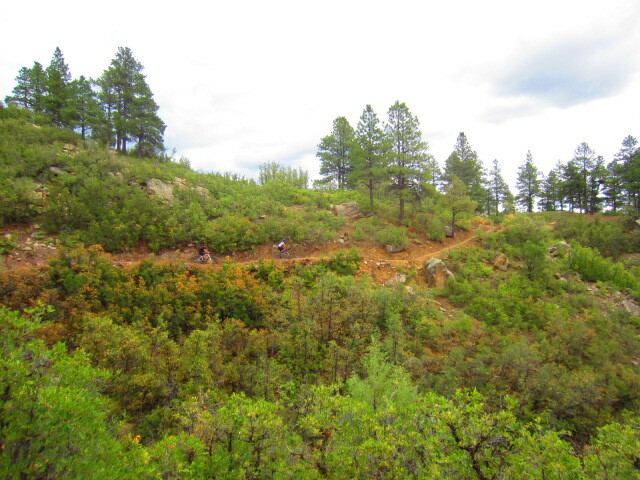 Either way, the trails were completed for us trail users in an expedient fashion because Daryl Crites of Trails 2000 used a Bobcat mini excavator. Use of that equipment has its benefits and drawbacks. The machine leaves a bigger footprint due to the trampling of vegetation, tread marks and deep cuts in the hillside, but it gets the job done faster and moves some obstacles that we humans could not move otherwise. Wildlife will continue to live on the property that the trail goes through. 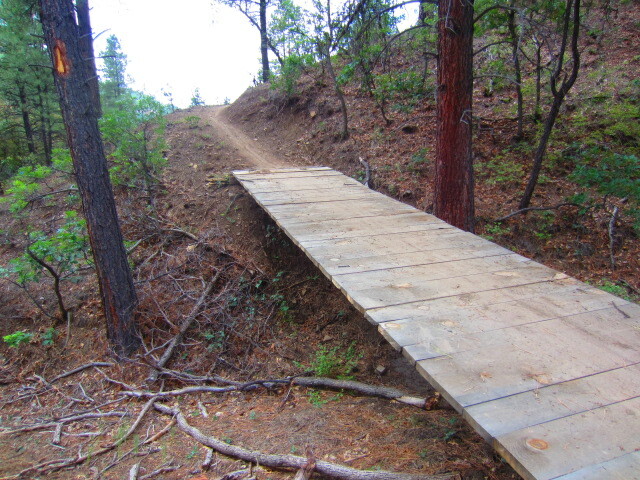 Cool bridge made with ponderosa beams on the bottom. 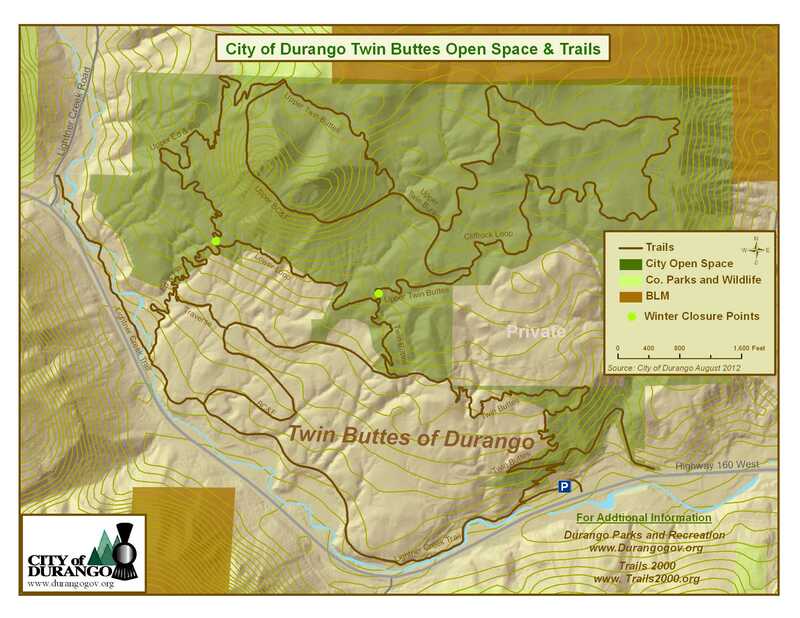 Seasonal winter closures of the upper level trails will be in effect to protect wildlife during the same time period as closures happening on Animas Mountain and Grandview Ridge. The lower loops will not have seasonal closures, according to Trails 2000’s Daryl Crites. 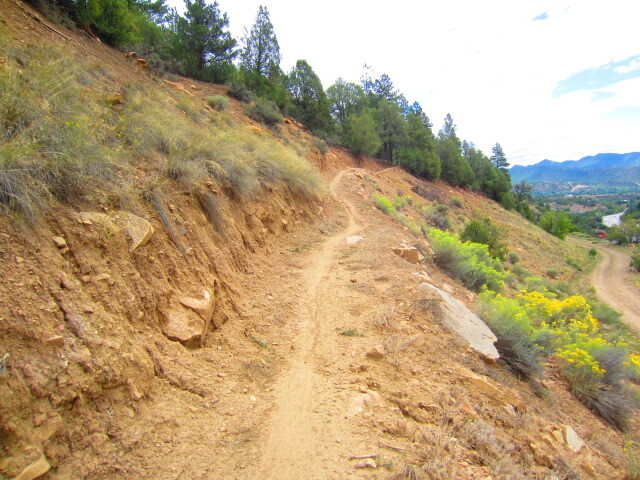 This is the trail that you take from the BC&F railroad grade road to start the Cliffrock Trail. Basically you just cross the road and start this new section of trail. “I believe there will be a grand opening of the system in the next few weeks,” Crites said. Some riders on the Cliffrock Trail. 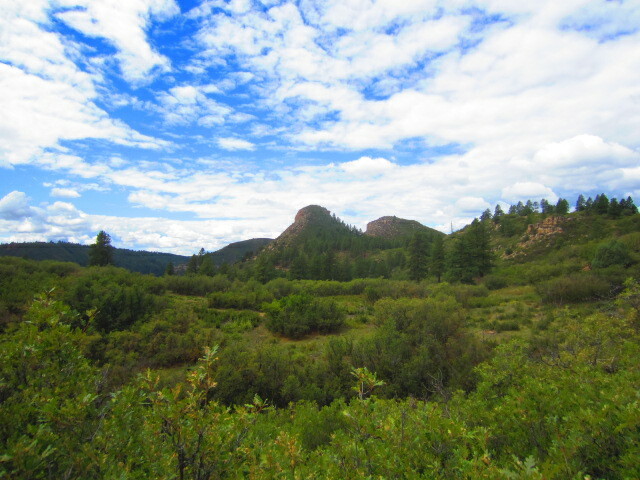 Perins Peak from the eastern loop that’s called the Cliffrock Trail. The Twin Buttes seen from Cliffrock Trail. 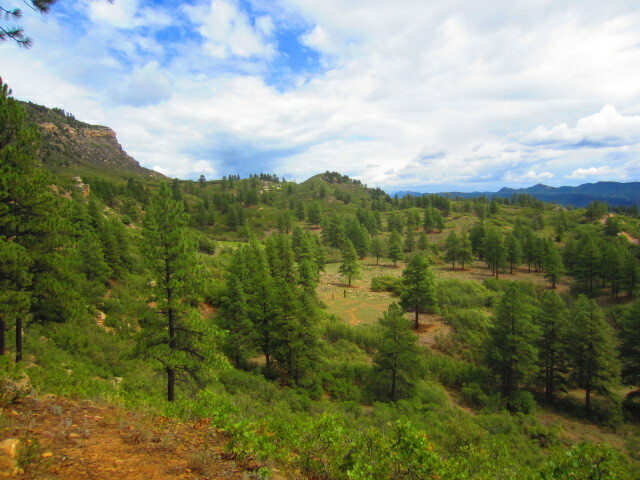 This is the view from the top of the switch backs by the eastern butte. 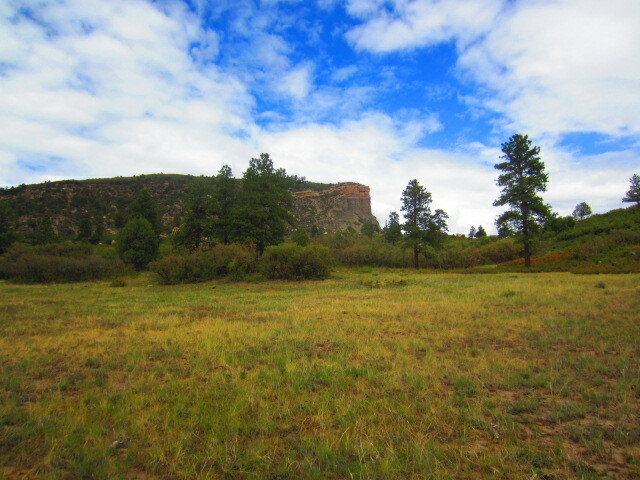 Here’s a scene from the Ed and Flo Trail, named for Ed And Florence Pauls, who donated much of the open space. This trail has banking turns. 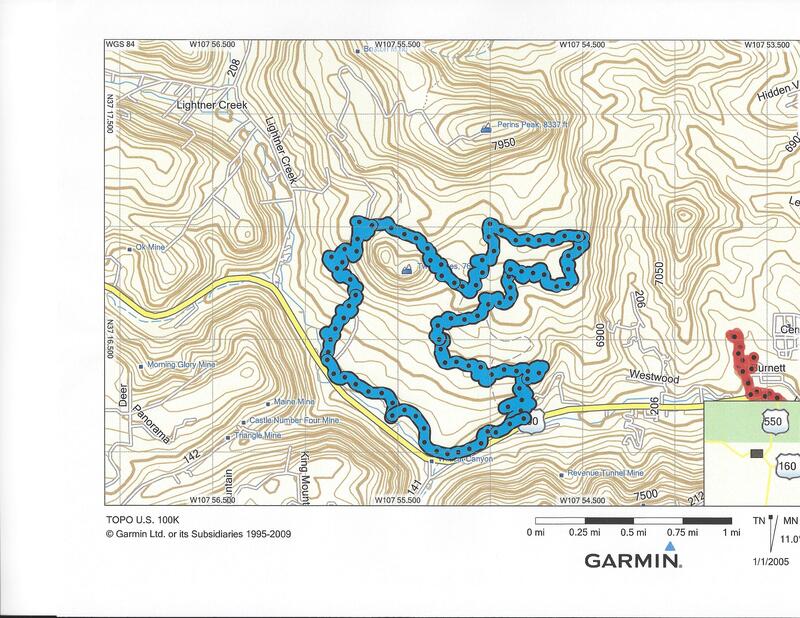 GPS track from Twin Buttes ride. Printable PDF of one Twin Buttes ride that I did–Click HERE. I’d recommend these fun trails to anyone.